"What should we do?" parents often ask. "Besides caring and providing for our children, what else do they need?" Here are solid answers. A child's future success depends on his or her early education. Parents are responsible for educating their children for life. More than ever before, parents themselves need educating today to know how to rear children properly — helpful steps and suggestions that can promote positive physical, intellectual and emotional growth in youngsters. 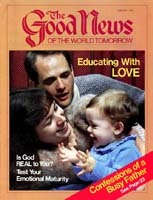 With this issue of The Good News. a series of articles on early education begins. The overall principle is this: True education begins with one word — love. So important is love and its ramifications that little learning of real value and worth takes place without it. Love is basic. It should be because of love that children are conceived. It is by familial love that children grow and mature properly. In an atmosphere of warmth and security, the infant thrives. He is secure in his mother's arms and his father's embrace. Their presence is his world — they provide for his every need. They remedy his discomforts and his longings. They calm his fears. Safety is being with them. They are to him his creators and protectors — his loving authority. It is in a loving family environment that children learn best, through trust, sharing and unity. This is especially true in the area of communication. The child learns to trust his parents explicitly. Every word they say is truth to him. He has no reason to question — nor can he, yet. Their voices provide comfort. He is enthralled by them. He catches the sound of their words. Did you catch that? Yes, your words are observed and noted by your infant. He doesn't understand the meaning of most words yet, but he is learning fast. And he's learning the inflections you put on certain words. He notes, and his body responds to, the rhythm of their syllabication. Are the words spoken in joy, happiness, wonder, disappointment, sorrow or anger? Whichever, he observes them all and they become part of him. His keen ears are picking up the beauty of the language with its rhythm and emotions. You are teaching him the mode with which he will think and express his ideas. How is your language? Is it spoken correctly? If not, neither will your infant's be, unless you make a conscious effort to correct yourself. Children should be exposed to a wide gamut of words. How? First, simply by talking to them while with them. Just talk — normally, naturally, frequently. Tell your child often how much you love him. Hug him frequently and let him know what a fine baby he is. As you go about your tasks, explain what you're doing. Remember, he's watching. Use a well-modulated voice. Maintain a warm, friendly relationship, though you must retain your authority in a loving, guiding, advising fashion. Talk with. not down to, your child. Keep the contact going throughout the day. Talk about everything. Don't restrict your communication to correction only. Being mainly a corrective is a sure way to damage the relationship with your child. But don't think you should never correct him. Correct and correct firmly when correction is necessary, and it will be. But you should have so much else going with him that correction becomes an acceptable part of the whole picture. He will learn early that correction is a natural, necessary part of life, not a discouraging, humiliating disaster to be feared and avoided. It's vital to watch your child's attitude. All else rests on it. He must be developing an attitude of obedience and responsiveness. If he is not, you could face hard years ahead, as his lack of responsiveness turns to further rebelliousness that can increase as he increases in size. Teach to listen? Isn't listening more or less automatic? Aren't sounds and noises all around us? Yes, sounds surround us. They are all over. There are outdoor sounds and indoor sounds. We hear them and get quite accustomed to them. Hearing may become more or less passive. But listening, as opposed to merely hearing, is a skill. Listening is an active process requiring conscious attention. It is essential to learning and becoming educated. Be sure that your child is developing this, skill. In order to learn he must hear and attend to what he is hearing. He must recognize and interpret what is taking place. Then he responds. Encourage your child to be sound conscious. Don't make it a habit to repeat directions, though you should realize there are sometimes valid reasons to do so. Often, you must simplify the terms after the original instruction is given. Having him respond on first instruction, rather than having to tell him several times to do something, gives him a gigantic advantage. Help your child "see" sounds. Have him notice your lips as you make them. Make the sound for the letter b. What fun you and your child can have pushing air out of your mouths as you say the sounds of p, t, c, k. Let him place his hand near your lips while you do so. As he grows, play games with sounds. Point out items in your home that start with various sounds. Whisper directions to your child and have him carry them out. This can be a lot of fun. Have your child close his eyes, then ask him what he hears. Have him identify various sounds such as a door opening, putting a lid on a pan, a musical instrument, scraping a surface, opening a window, tapping your foot, clapping your hands, wrinkling paper, bouncing a ball. Oral instructions can be increased according to your child's age. Start with one-, then two-, building up to three-, four or five-stepped instructions. Have your child carry them out in order: Go halfway across the room, turn right, sit in the red chair, tap your foot, fold your hands. When playing this outdoors, hopping and jumping add to the fun. Vary this game with useful home responsibilities: Crawl across the room, pick up two bits of paper and a thread, slowly and carefully walk backward to the wastebasket, put them in with your right hand, walk back normally. You can think of many activities to fit your family's needs here. Have your child explain how he gets from the kitchen to his bedroom, from your front yard to your backyard, from home to school. You do four or five different things, then have your child recall the things you did in the order you did them. But do make these fun games, not rituals. Be sure to limit the time for intense listening according to the child's age. Use loving judgment. Generously praise, hug and kiss for outstanding listening. Give your child much listening for enjoyment. He needs informal listening in play, too, and incidental hearing. Following directions is a learning process. It involves listening and responding. It begins simply, then, if carefully nurtured, develops into a worthwhile lifelong habit. The next article in this Good News series on early education will delve into the delightful literature of childhood. Joan C. Bogdanchik has taught at the elementary level in both public and private schools. She taught at Imperial Schools in Bricket Wood, England, from 1970 to 1976 and is a member of the faculty at Imperial Schools in Pasadena, Calif.